While we were admiring how impressive Mt Ngāuruhoe looked on the big screen in Lord of the Rings – work was underway to protect this most famous New Zealand volcanic cone, and its legendary warrior brothers Mt Ruapehu and Mt Tongariro, known to Māori as Te Kahui Tupua, or the sacred peaks. Tonkin + Taylor’s new principal planner Grant Eccles was the man for the job. He led the consultant and council team charged with ensuring the future protection of the three mountains as part of creating the Ruapehu District Council’s District Plan which sets out how development will be managed. Eccles has made a career out of working on some of the hardest, most complex resource management cases in the country but he says this was particularly challenging. “The Council’s area includes the World Heritage Tongariro National Park, the three impressive volcanoes, ski resorts, The Chateau, NZDF’s live bullet/bomb training area, The Bridge to Nowhere, Tangiwai Memorial, the National Grid, State Highway 1, part of Whanganui National Park, 12,000 residents and even fewer ratepayers”. 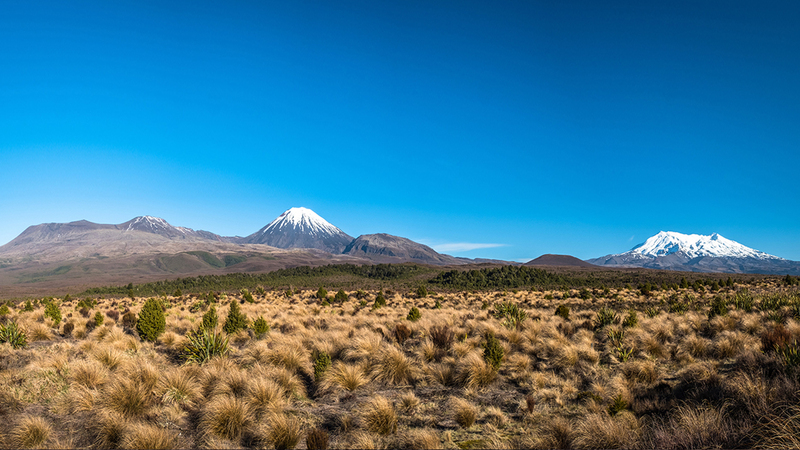 Part of getting it right was having the foresight to protect the iconic side-by-side view of Mt Tongariro, Mt Ngāuruhoe and Mt Ruapehu that you can see from the Central Plateau township of National Park. “There is provision under the Resource Management Act to protect a view. A viewshaft can only be used where there are outstanding landscapes or features involved and that view of the volcanoes is certainly pretty special to New Zealand, and probably the world”. The three maunga (mountains) are enshrined in Māori lore as gods and warriors of great strength who one night launched a fiery, earth-rattling battle to win the heart of the only female mountain in the region, Pihanga. Tongariro emerged victorious. Ngāuruhoe and Ruapehu then slunk away, taking up residence just to the south of Tongariro. So, importantly, getting it right also meant engaging with the Central North Island iwi (tribes) and hapu (sub-tribes) for whom the maunga (mountains) are sacred – Tūwharetoa, Ngāti Rangi, Ngāti Hikairo and Ngāti Uenuku. Tyronne (Bubs) Smith, of Ngāti Hikairo, sat on the Ruapehu District Council’s District Plan hearing panel. From the outset, he says, the idea of viewshaft protection met with universal acclaim. Eccles has joined Tonkin + Taylor to head up its Waikato planning team, “I’m very lucky to now be in a position where I can choose what I work on and so I’ve decided to focus on the high level, technical resource management work – important and significant projects that benefit the community and country”. “It’s not just about doing them, it’s about doing them right. I’m a Thames Valley Dairy Farmer’s son so I’m a firm believer that resource management planning should be sensible and pragmatic, it has to work in practice and produce the outcomes you want on the ground. Eccles is currently involved in projects that aim to restore and enhance the water quality of Lake Rotorua and the Waikato River, so that future generations can enjoy them for years to come.